I came over to this computer intending to write a Coffeeneuring Challenge update (entries due this Monday! ), but instead I’m pondering other matters– small changes in my own life that have altered my daily routine and energy levels for the past few months. One month ago– though it feels longer– I completed my second marathon of October, the Marine Corps Marathon. It was a stimulating event that turned out to tip my emotions and fitness into unexpected fatigue. I lost most of my enthusiasm for riding and running, and ate too much during the lull. I fell out of balance, which sometimes happens to me after a period of intense activity. In addition to post-marathon tireds, I had been interviewing for a new professional opportunity– turns out I can’t be a professional blogger and coffeeneur after all– and wasn’t aware of the ways this self-imposed pressure and commitment eats away personal energy. Scheduling time for interviews, packaging and presenting one’s professional self to new people, the nerves before and after meetings– these all overlaid my daily routine for at least a couple of months. Won’t be taking this commute route much longer. 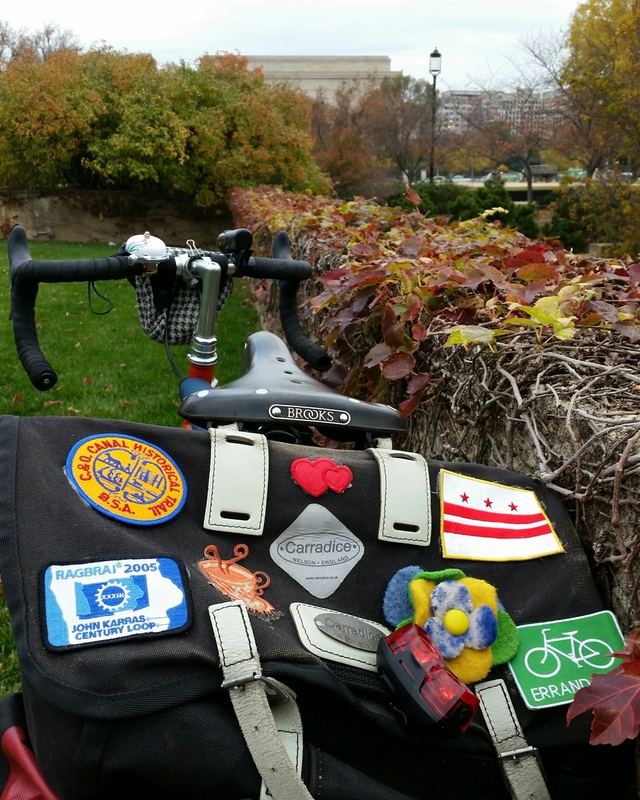 I’m now across the finish line of many goals I set this year: full Super Randonneur series; one spring marathon and two fall marathons, including one that I bookended with a mini-bike tour; a two-week Colorado bike tour; a 1000K brevet; and securing a new job. Invigorating and satisfying, yet tiring at times. While not the most active person, the pursuit and accomplishment of these various endeavors wore steadily on me. Looking back, I know I could have done things to keep myself running a little better, but it’s ironic how losing one’s balance can create a situation where healthy choices about things like diet and sleep are not made. Instead I thrash unsteadily about, grind my teeth, munch on junk, and sleep poorly. This week I’ve been working my way back to improved equilibrium, particularly as it relates to my food and sleep habits, and I’m feeling better. I’m packing up my office, saying farewell to my current routine, and looking ahead to a new job and a different commute. I’m reading the rumblings that have begun about Paris-Brest-Paris, and I’m trying to figure out how I can make that happen in 2015. I had so many programs running at once that a system crash was inevitable. Fortunately, I saved all my work so I can calmly drink a cup of coffee while the hard reset happens. To get everything going again will take effort and yeah, I’m a bit nervous, but also ready. I’m ready for change and this hard reset. Thanks for reading. We now return to our regular schedule of coffeeneuring activities. Congratulations on the new opportunity! This has been plaguing me for a while now, and I had a breakdown because of it, which is why I spent the better part of this year resetting myself. Good on you for preparing for the reset. Best of luck with the new job! I’ll be thinking of you. It’s crazy how it can get to a person. And you can rationalize it, but it still is there, taking up your energy. I am amazed my mouthguard is still in one piece after all the intense grinding of teeth! I hope your reset goes/is going well. Congratulations on your new professional opportunity. And kudos for maintaining such an intense personal agenda while exploring and acquiring the new direction. Your ambition and energy is inspiring. Thank You and Best Of Luck…. Thank you for sharing. It’s impressive that you recognize it’s time for a “reset”. Your accomplishments are impressive too. Best of luck to you and congratulations on the new job! Wow, Georgie that is a lot, but you are right that a full life is brilliant. It’s all about letting the various pieces settle into each other. I love this. That is a good way to look at it. “While not the most active person”, MG, seriously? OK you aren’t literally THE most active person but…. Congratulations on a monster year! Thanks, guys, though I’d hardly put you at catatonic, Shawn! So true. I really have needed the break, and finally I’m starting to look forward to taking on longer rides again. Thanks, Joel. How exciting – and exhausting – both at the same time, I’m sure! Congratulations to you on the new professional adventure that has come your way. I hope that it is something amazing for you! It’s incredible to realize that I’m not the only person who struggles with the imbalances at times. I appreciate you sharing these moments because I’m guessing I’m not the only one who fights with such things either. Thanks, G.E. I know I’m lucky to have these sorts of things to worry about, but it is funny/odd to me how I cannot wish myself to just mellow out through these times. I’m a bit of a worrier by nature. I hear you. I’ve just been reading another blog where she talks about how even the good/fun stress is still a stress on your body, even though at the time it doesn’t feel that way.